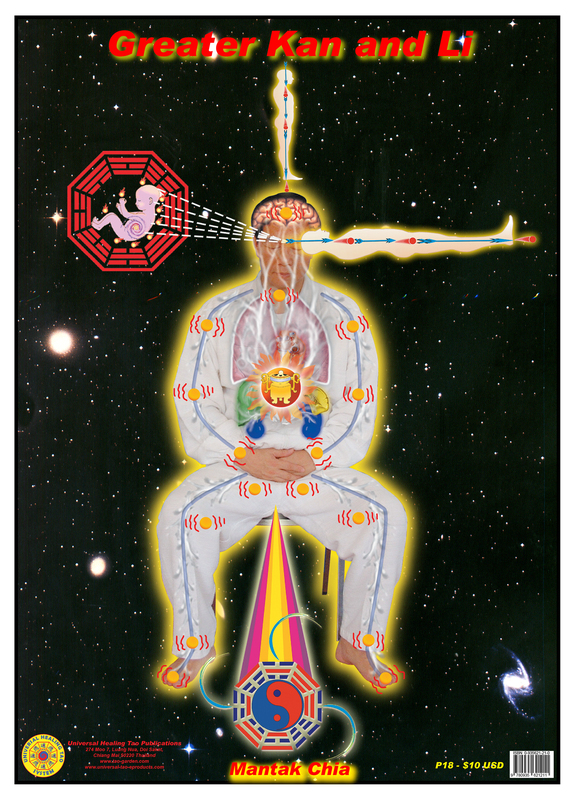 This poster illustrates Master Chia in a Sitting Posture opening up the Twelve Channels of the Body activating the Five Vital Organs with the Steaming Techniques extending the Energy Body from the Mid-Eye with the Immortal Fetus and extending the Lower Pakua below from the Perineum. The starting point for the Greater Kan and Li can be viewed from a simple perspective similar to the Lesser Kan and Li from Water and Fire. This common sense relationship also involves cauldrons. The latter are of different sizes and shapes in addition to being made from different materials. Being aware of the significance of Water and Fire gives an overall context to assist with a more meaningful grasp of Kan and Li practice on any level including the Greater Kan and Li. This is the Tao of Virtue and the development of the Immortal Fetus. It entails an energy body, which needs to be comprehended in relationship to these critical elements. Initially, however, thinking of Fire, Water and steam rising from the cauldron at the solar plexus will initiate the correct context of the Greater Kan and Li.